April 22, 1904. – Real Estate Transfer- Marion F. Schroeder transferred to Brooks & Taylor, for $75, tract of land containing 50 acres, more or less, in Federal Point Township, beginning at a point known as the Old Newton Landing. WILMINGTON STAR, 4-23-1904. November, 17, 1905. – Real Estate Transfer – Ed Taylor and wife and John W. Brooks and wife to Samuel A. Lewis, of Shallotte, Brunswick County, for $95, a tract of land containing 50 acres and situated on the eastern side of the Cape Fear River near the old Newton Landing. WILMINGTON MESSENGER, 11-18-1905. June 1, 1906. – Real Estate Transfer – Melvin L. Smith and wife to Ellen Kure, for the sum of $325, lot on Carolina Beach. WILMINGTON MESSENGER, 6-1-1906. December 20, 1910 Real Estate Transfer – W. F. F. Newton and wife, et al., transfer to Archibald J. Hanby, for $100 and other considerations, 103 acres of land in Federal Point Township, adjoining lands of W. A. Ainsworth and others. WILMINGTON STAR, 12-21-1910. 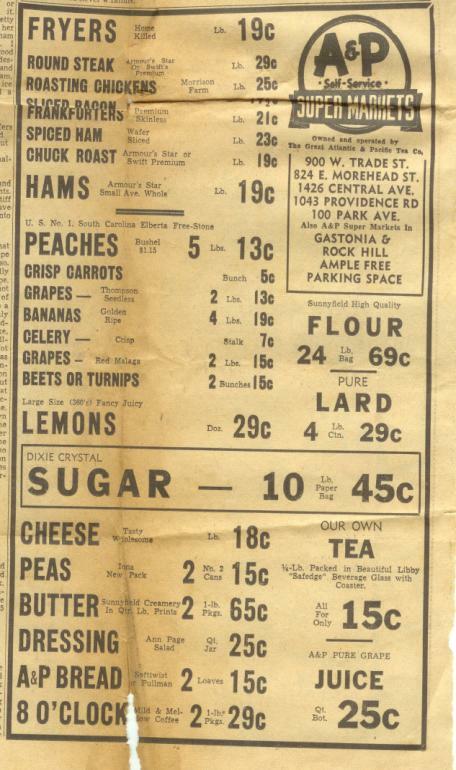 Food prices have changed in Kure Beach since the 1920s. A&P ads for July 4 specials in the Wilmington Morning Star were compared for 1927, 1937, 1947, and 1957. All A&P stores were closed during the July 4th holiday. Ground beef did not appear in any July 4th A&P newspaper ad during this time. In 1957, Ham was featured in every July 4 ad – 29¢ a pound in 1927; 53¢ a pound. In 1957, Hot dogs (Frankfurters, Franks) were 23¢ a pound in 1937; 49¢ for 12 oz. in 1967. The price doubled and the package size decreased in this time period. All meat hot dogs were advertised. In 1957, Peanut Butter was 19¢ a jar (size not listed) in 1927, and 55¢ for a 24 oz. jar. Ingredients for making baked beans, coleslaw, and potato salad were advertised, but not the finished item. Thompson Seedless Grapes – 69 ¢/lb. Chuck Roast – $1.18 / lb. Convenience mixes advertised in 1978 were Hamburger Helper, Shake n’ Bake, Stove Top Dressings, Coffee Creamers, Frozen Pie Crusts, Green Giant Frozen Foods.